The camera department in phones has been a main point of discussion. When purchasing a smartphone these days, the camera factor immediately becomes important. A fierce camera comparison ensues,we check out the camera performance of flagships from major player in the mobile industry. 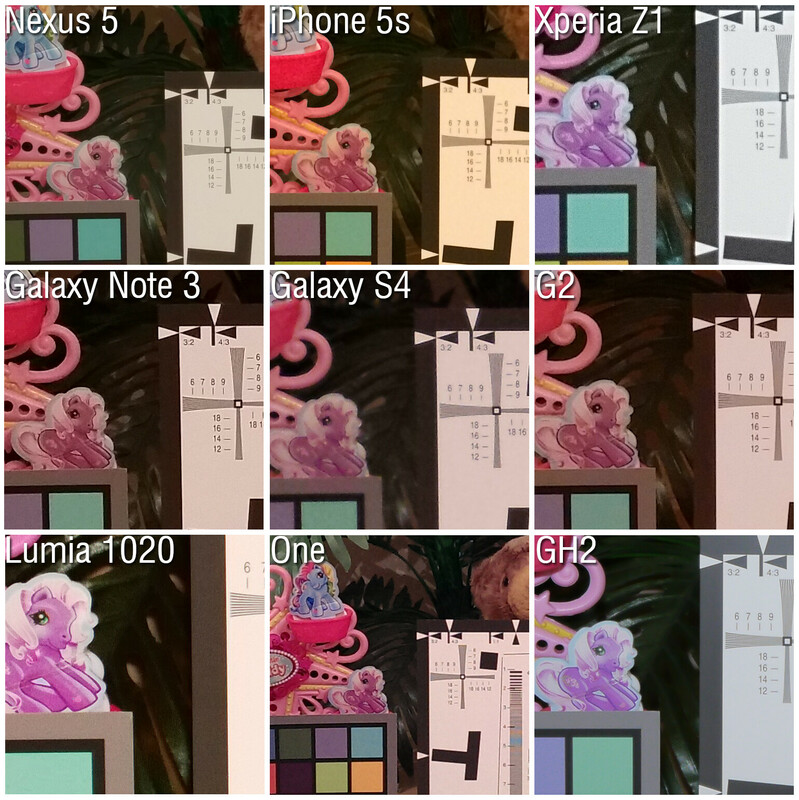 According to raw specs, the Lumia 1020 has the biggest sensor while the brightest lens is sported by the HTC One and the Xperia Z1. Others dont lag far behind when considering max aperture, however the Lumia’s sensor is quite big, it is bigger than most point and shoot cameras( Which mostly have 1/2.3″). The Lumia also has the widest lens, although the other competitors are also nearby. 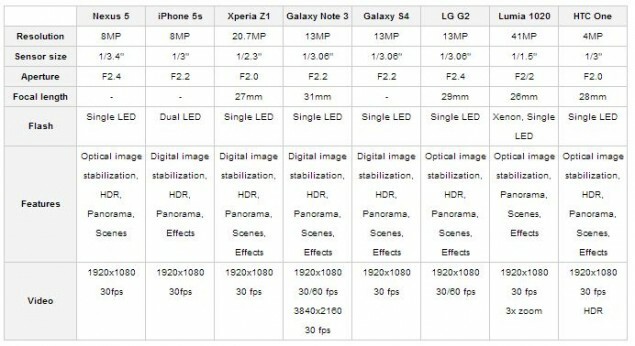 With the exception of the note 3, all other phones record a maximum of Full HD video. 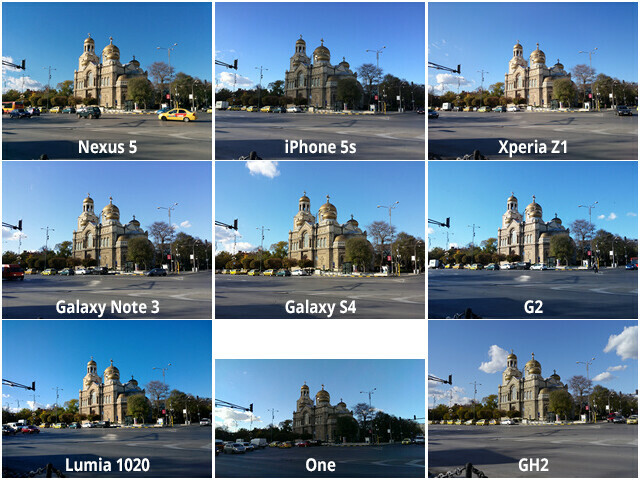 It is evident from this image that the Lumia 1020 is outmatched in amount of detail captured. Helped with the monstrous amount of Megapixels at its disposal. The Nexus 5 surprisingly also captures a good amount of detail here. 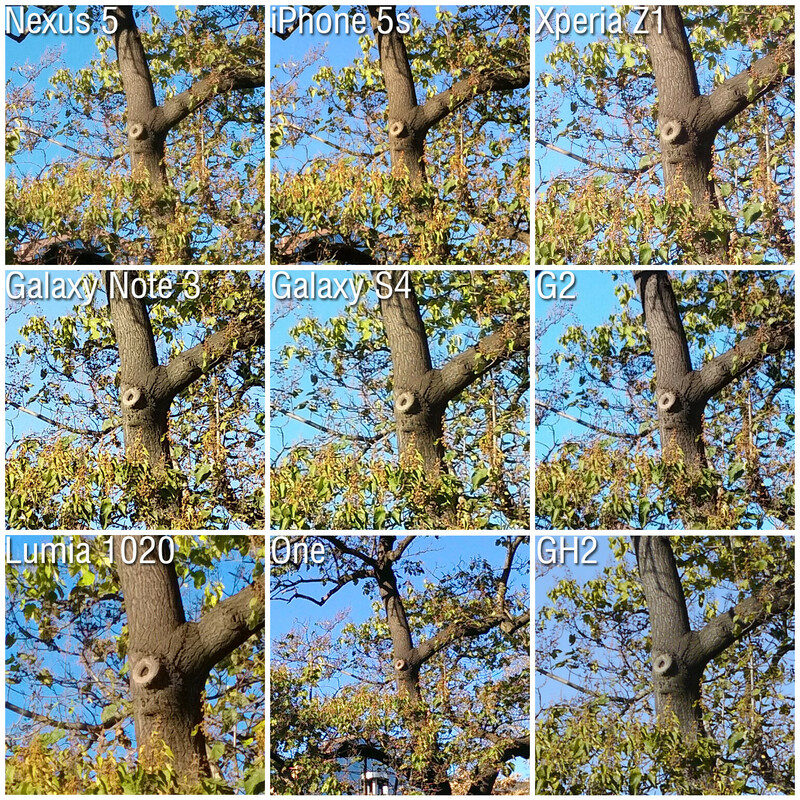 The Z1 also does well but does not live up to its 20 MP sensor. The HTC One as expected cannot capture as much detail with just 4 MP at its helm, as a result it does poorly. The iPhone 5s manages a fairly good image almost equal to the Note 3 and the Galaxy S4. As Stated in our previous review, some phones saturate their images for no reason. The color of the sky has different tones in all the images. For example Lumia and LG G2’s image has a vibrant blue, while this may look appealing this ensures loss of color accuracy. While on the other end, the HTC One’s image looks washed out, with the sky looking slightly grayish. iPhone 5s produces a slightly underexposed image however the colors are fine. The Galaxy S4 and the Note 3 produce the most acceptable colors. You’d expect the HTC One to shine in low light photography with its advertised UP camera, and bigger pixels. It fails to deliver here also. Unsurprisingly, the Lumia 1020 again has the upper hand here with its Xenon flash. The Note 3 produces a clearer image here than the S4, the Z1 also produces a good image while the iPhone 5s lags slightly behind it. Surprisingly the LG G2 did not fire its flash, it relied on a longer exposure time. The HTC One again overexposes and is the only one standing out from the others. 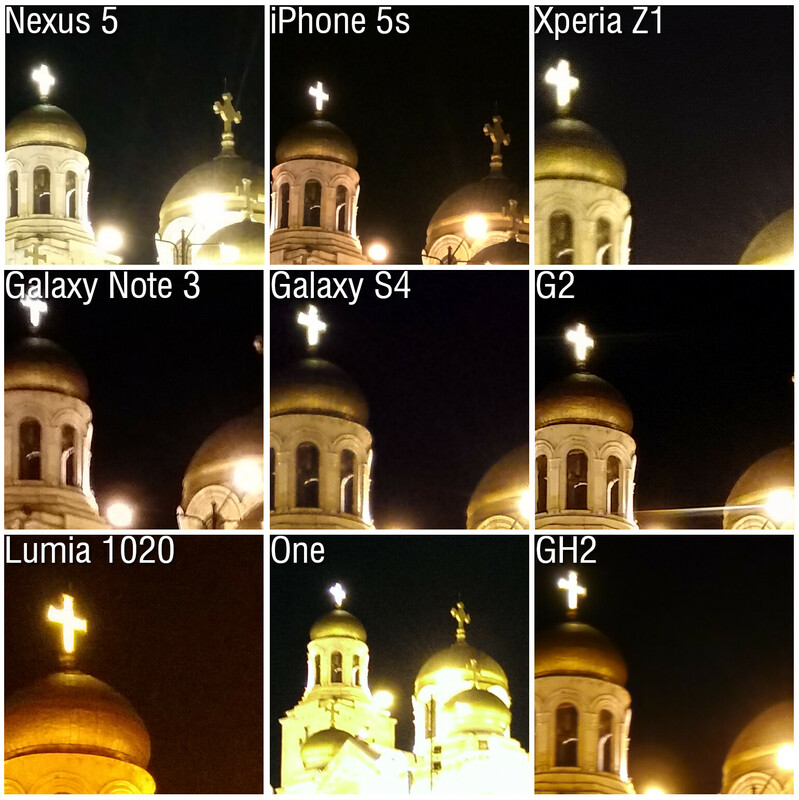 The Lumia’s image has more noise than others, but more detail is also present. The Z1 has a slightly blurred image. The LG G2 along with the iphone,note 3, S4 and the nexus 5 produce acceptable photos, however G2’s image is the most sharpest. All the phones produce top notch video, however it is a known fact that the iPhone produces the most smooth video. The Note 3’s 4k video capability gives it the upper hand in detail. While all the phones produce acceptable vids, the iPhone and the Note 3 do better than others. It is evident from the specs and from the samples from phonearena that Nokia’s Lumia 1020 is indeed the better cameraphone. Also the HTC One is not exactly the worst, its pictures are not usable beyond a small scope. The Google Nexus 5 does well to hold its own in this fight, not lagging far behind the other phones, the iPhone 5s gives good all-round performance near to the S4. The Z1 does come in second while the Note 3, S4 and the G2 manage a tie at third place.